In my role as admissions counselor, I think what personally motivates me is my love of children, being in a place that helps children develop their strengths and fosters core values. I feel strongly about that, and I think it's because it's what I wanted for my own children. John and I will always be grateful for the education and experiences our daughters received at Peck. Since 1985 we've been generous with our time, and financially (to the extent that we are able) we will always support Peck. We are hopeful that someday the next generation of our family will attend Peck and reap the same benefits as their parents. What do a long line of people waiting in the cold for a handout of bread during the Great Depression have in common with a group of college co-eds eating breakfast with two US Presidents over seventy years later? They are the symbolic bookends to an amazing educational journey experienced within two generations of the Worthington family. When Annette Worthington’s grandfather Joseph immigrated to the US from Naples in the 1920s, he had great hope and ambition for his family—but he arrived in the greater New York City area just prior to the US stock market crash. Annette’s father, Joseph Jr., was born in 1929 and remembers standing in line for bread with his family during those terrible depression years. When Annette’s father turned 16, even more misfortune required that he drop out of school to care for his ailing father. Being forced to abandon his love of math and his overall educational ambitions, Joseph Jr. became all the more determined to advocate for a great education for his daughter, Annette. His success and continuing belief in the power of education provided the impetus for Annette to become the first woman in her extended family to attend college. Annette obtained a Masters in Educational Psychology from Montclair State University, and an undergraduate degree from Chestnut Hill College in Philadelphia, where she also happened to meet the love of her life, best friend, and husband of 40 years, John Worthington. Annette and John’s New Jersey roots predisposed them to look for a school in the area. Although devoutly Catholic, John and Annette chose Peck over public and parochial and other independent options after visiting and being impressed with the academic program, the emphasis on core values and the sense of community at the school. Over the years, they enrolled their four daughters, whose learning styles differed and at Peck they found understanding and partnership when the ups and downs of their children’s growth and progress through school invariably occurred. 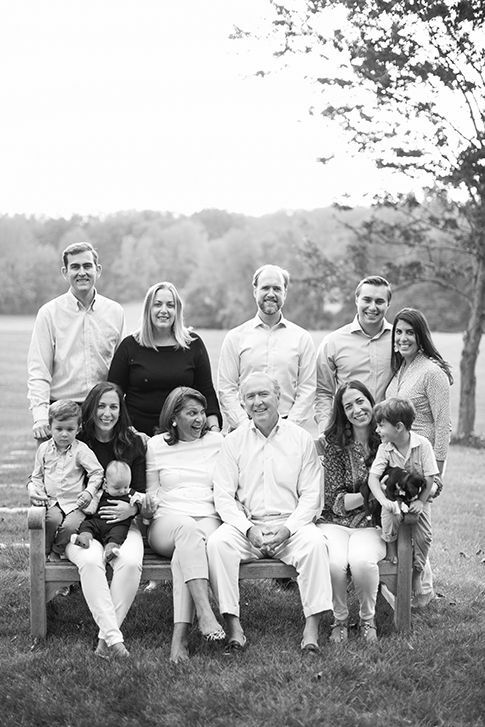 Annette and John spent 18 years of their lives as Peck parents and as their daughters, Lauren ’94, Brooke ‘96, Devon ’99, and Taylor ‘03 transitioned through their K-8 years, the Worthingtons volunteered on countless committees. Annette also served as President of the Parents Association, and John spent 12 years on the Board of Trustees. Every capital campaign that I've been associated with just takes Peck to a higher level. I believe in the school, and I support it. And I think that all of these capital projects were well-thought out, well-developed, and completely supported our students and their learning. Jim and his wife Colette have also benefited from past campaigns from the perspective of Peck parents. Their sons Colm ‘05 and Liam ‘07 were some of the earliest students to attend the new F.M. Kirby Lower School. Both boys went on from Peck to attend the prestigious Delbarton School. Colm attended Georgetown University and is now in his second year studying Law at Duke University. Liam attended George Washington University and now works as a consultant for the Washington Metro. In support of The Peck Promise Campaign, Jim says, “As a school, we are really, really, taking our program to the next level. I get excited about new processes, new avenues to approach things, and I've always embraced change."